Never trust a man who holds suspicion for socks. It's a motto I live by and one which, having watched Kiyoshi Kurosawa's Creepy, I'm convinced more than ever should become a universally accepted truism. Nishino (Teruyuki Kagawa) is the barefoot baddie in this dread-filled Japanese horror. He lurks and shuffles around an otherwise tranquil neighbourhood in a manner which invites suspicion - his hunched frame suggests that his bones don't quite properly fit into his body and there's something off about the way his eyes strangely linger. He's openly strange and low-key hostile; in a polite society like rural Japan, Nishino sticks out like a sore thumb. Yet, despite this, there's no evidence that he's done anything wrong. Is he an evil whom lurks in plain sight or just a slightly odd, eccentric man who wants nothing more than to live in peace? 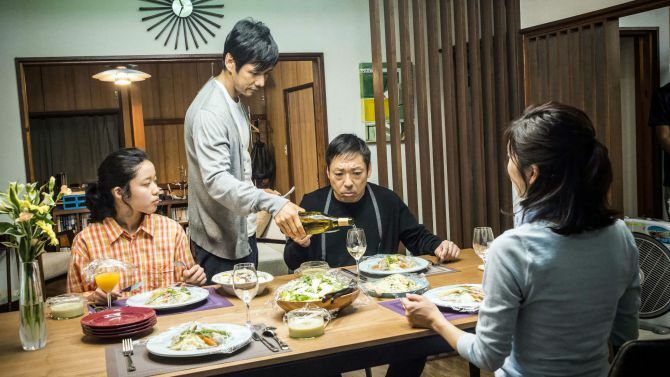 As Nishino's neighbours ponder his increasingly bizarre behaviour, former detective Takakura (Hidetoshi Nishijima) finds himself drawn to an unsolved case from six years ago in which an entire family disappeared without trace and for which no suspect has ever been arrested. His paranoia begins to cloud his judgement - could the stooped man-next-door somehow be involved with the crime? Is he plotting violent wickedness anew? Or has the stress of his case caused Takakura to imagine clues which aren't even close to being real? For the first two acts of the film Kurosawa keeps us on the edge of our seat with the slow-burning eeriness he has made his trademark in movies such as Pulse and The Cure. Cuts are slow to emerge and, instead, his camera keeps us entranced with long-shots of deep focus - we witness meticulous frames of Takakura investigating outdoors as gentle winds cause trees to delicately sway in the background; Kurosawa is hinting to us that there's unseen forces constantly at play here. As we guess the twists and turns ahead of us, slowly piecing together the puzzle, we also marvel at the exquisite compositions of the shots. It's rare that a horror movie looks this beautiful. Yet, despite some incredible performances here and stunning visuals, Creepy is a film which fails to sustain itself; a big third act reveal forcibly removes the feature from a genuinely anxiety-inducing terrain into altogether more camp and shlocky territory. The strength here are the formal qualities - the editing, sound design and cinematography in particular create a remarkable mood piece - and, thus, once the rather convoluted narrative conclusion kicks in, we're unable to sit back and enjoy the masterful technical aspects of the movie. Indeed, most of the joy of the film comes from the moments we're left in suspense never knowing what's coming next - if it's the not knowing which kills us, in Creepy it is the arrival of clarity which kills the enjoyment.